Whenever I’m feeling sorry for myself or irritated with the world, I think of Father Waseem. He’s a Catholic priest in Pakistan who might be the happiest person I know. Recently I caught up with him in Rome where he was taking his first vacation in years. It was a brief respite from a life that is, well, full. His adjacent K-8 school serves 150 children each day, and a few years ago he opened a sewing school to help young women learn a trade. In Pakistan, Christians are often forced to work as housecleaners in Muslim homes where they end up marrying the man of the house for economic and other reasons, and are then forced to convert to Islam and essentially renounce their families. The sewing school is creating viable career options for these young women. In addition, he is the local parish priest and responsible for training religious education teachers throughout his diocese. The orphans are aged 6-14 and come from a variety of difficult situations. Sometimes their parents die, or they are simply abandoned at the gate. Father W’s children come exclusively from Christian backgrounds as it is very dangerous to convert Muslims to Christianity – both for the convert and the teacher, and potentially punishable by death. Most of the 2.5 Million Christians in Pakistan (an estimated 1.6% of the population) – including his grandfather, were converted originally from Hinduism by English and Italian missionaries. The British partitioned India into largely Hindu India and Muslim Pakistan in 1947, and like much of the “partitioning” that went on in the Middle East at that time the unintended consequences continue to reverberate. Although the Founder of modern Pakistan, Muhammad Ali Jinnah, promised Christians he would make it an integrated, secular state in his inaugural speech, he quickly died and the country was overtaken by a more religious mindset. Pakistan officially became an Islamic state in 1957 with Islam as the core of its national identity and legislative system. Children in the orphanage learn to care for themselves, and each other, at an early age. They wash their own clothes by hand (starting at 6 years old), and are responsible for cleaning their living quarters, the bathrooms, school, etc – with the older children teaching the younger ones. There is no money to pay for these services and it is essential they learn to be self sufficient, as they must leave at age 14 to more or less fend for themselves. Few go on to any higher education. Faith is one of the few sources of hope these children will ever have. Scripture and religion classes are an important part of the daily curriculum, with Mass every day at 6:30 am (attended by the orphanage and some 30 villagers), and Sunday Mass at 10 am. In addition there is a daily rosary at 6:00 pm every day, followed by dinner at 7 pm, homework and then bedtime. Father W says the children attend Mass joyfully, and if he is running late the older kids start the rosary without him. In Pakistan, that faith is tested regularly and must be strong to withstand the institutional discrimination/segregation, regular bombings, arson and murder by extremists – which is seldom prosecuted. 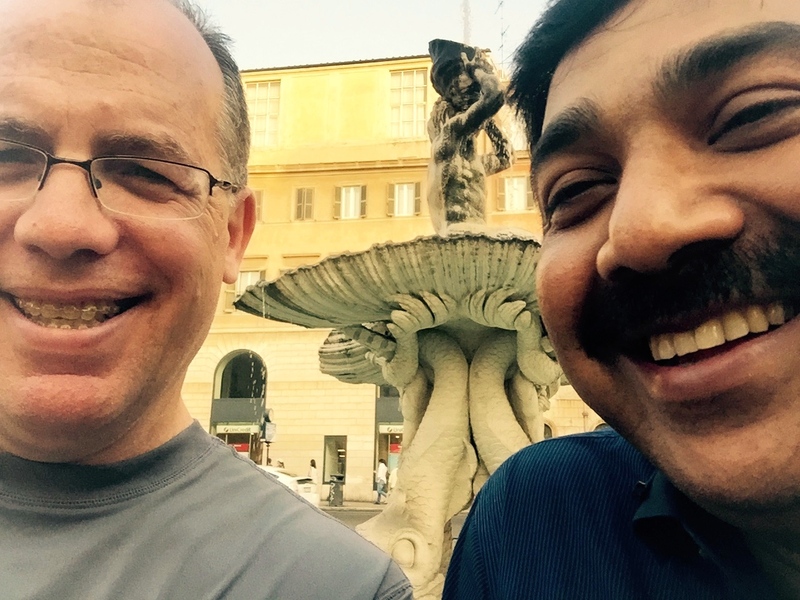 As I sat with Father W in a piazza in Rome watching the cars go by he had been there for a 10-day holiday visiting “brother Pakistanis” studying for the priesthood. He commented somewhat wistfully how relaxing it was to sit in a public place not worrying if you were about to die. Then he showed me pictures of a Christian school that had recently been burned to the ground, and talked about the debilitating impact – particularly for children – of living under more or less constant fear. The violence comes quickly and unexpectedly, making each day an exercise in extreme faith. His situation is extraordinarily difficult, but he sees light. Education, the Internet and modernity continue to impact the younger generations, and it is his hope that the current violence represents the last, incredibly violent gasps of a dying ideology. Change will not come easily, but in the end he believes better ideas, more contemporary and hopeful ideas, will win. I pray he is right. Like pastors everywhere, problems seem to find Father W on a daily basis. In addition to the orphanage kids who have health and social issues, his parishioners and virtually all Christians within walking distance come to him when they need medical assistance, food, shelter, counseling, etc. He does the best he can, but admitted sometimes he is so tired he just shuts down and pretends nobody’s home. He told me about one family with three children, all blind from birth. He had visited their home and the middle child (7 years old) was alone. The parents had brought the baby to work with them at a brick factory, and the older child was not there for some reason. The middle child told Father W that he wanted to die, because all he did was sit at home on his bed all day doing nothing and didn’t see much reason to be alive. 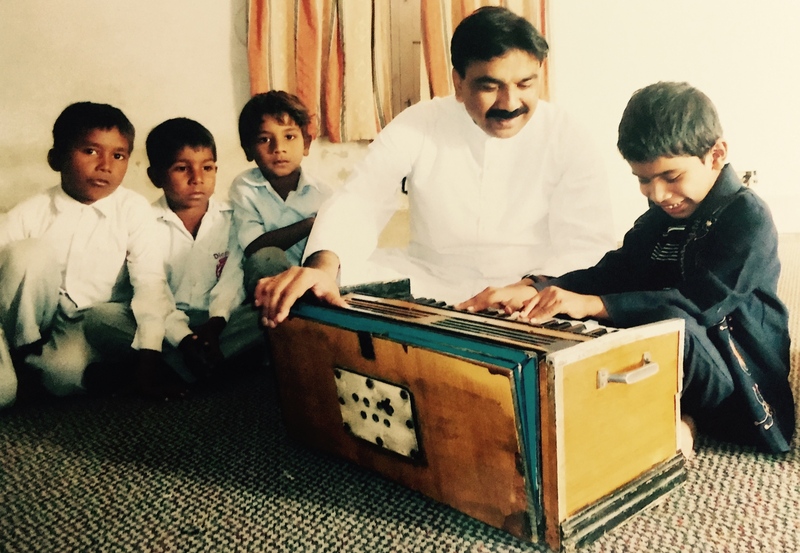 He wasn’t quite sure how to help, so he talked to the parents and the child is now coming to the church once a week for lessons on the “harmonium,” a small organ of sorts. His older brother is learning to play the drums and the idea is to teach them how to make music at church with the other children. They love it, and though he cannot take them more than once a week, he feels this has given them hope that perhaps they do have a future. That stuck with him, and my sense is it’s the only philosophy or theology he worries about. 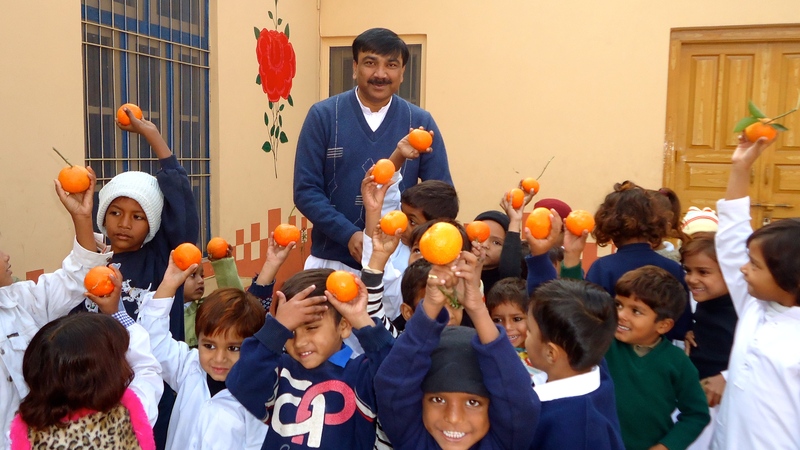 Currently he has three young men in the seminary in Pakistan from his parish, and he is very proud that his model of a simple priesthood, focused on love for God and neighbor, may create more pastors. It takes 10 years of study, formation and apprenticeship, beginning at age 16, to become a priest in his country. The remarkable thing about Father Waseem is that despite the hardships he is congenitally happy. He smiles constantly, and does not come across as a pious “saint.” He is mischievously funny. While in Rome we visited the Church of Jesus, a beautiful 15th century basilica that houses the tomb of St. Ignatius of Loyola (founder of the Jesuits), and the right arm of St. Francis Xavier (said to have baptized over 300,000) in an ornate silver reliquary. When it was time to say goodbye, I went to give him a hug and it became clear this isn’t something Pakistani men do. We laughed at my awkwardness, and I decided to make one last attempt at unraveling the secret of Father W’s universe. I asked him how he could jump out of bed every morning so excited and happy to be alive when he was surrounded by such extreme poverty, violence and intractable problems. What was the secret and source of this kind of joy? I told him we Americans are often congenitally unhappy, the result of a consumer and celebrity culture obsessed with obtaining what we don’t have and becoming who we are not. Tony this is beautifully written. Father W is very inspiring. I am now thinking of all the lives he is touching in Pakistan. I, too, find the name Center for Hope fitting because he certainly seems to be giving those children great hope. Just beautiful. Thank you. He is quite a guy – I feel lucky to know him. Looking forward to seeing you and Brian! Tony, this is beautifully written. I feel that I know much more about Fr. Waseem’s well named “Center For Hope” and how he is spending his life for others. Let’s hope he is right to believe that the current violence in Pakistan represents a dying ideology. His weariness at the end of the day is so reminiscent of Christ’s need to get away at times to rest from the constant demands and endless needs of others. He is remarkable. Thank you for bringing his story to us.